In a previous blog I described a walk down Walcot Street, now known as Bath’s Artisan Quarter. Sadly, I have to report that on a New Year’s Day walk along the same street, we went further on past St Swithin’s along the London Road. We were heading for the Holburne Msueum (closed as a Bank Holiday). It was not so pretty or artisan on this route. 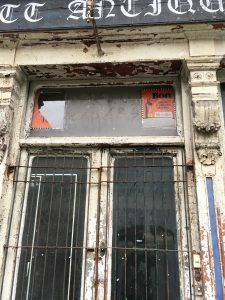 Some of the buildings have been neglected for decades and even though there were businesses behind some of the unloved and derelict-looking premises, they did not look inviting. 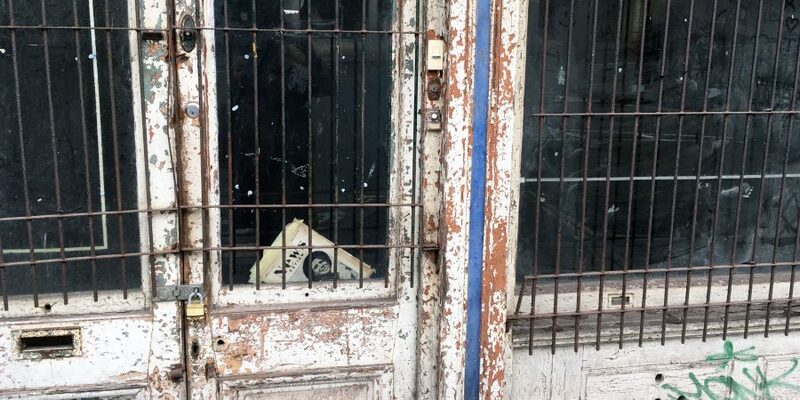 I wondered what really went on behind these shop fronts. Such a waste of space if empty, when every town and city is desperate for more housing. On a different route back, we stopped to watch council workers cleaning a pavement. I saw a trail of blood across the flagstones, which they were dealing with, from a stabbing the night before. 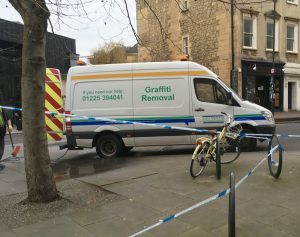 The council vehicle had ‘Graffiti Removal’ written on the side. I suppose ‘graffiti’ covers a multitude of sins – any unwanted substance on any surface. What a job for New Year’s Day! Bath is a city of contrasts. Ancient and modern. Light and dark. Beauty and ugliness. Poverty and wealth side by side. Handel’s Messiah at the Abbey, full house for the Panto at the Theatre Royal, pianist playing in the Pump Room, street vendor touting cheap plastic toys. Foreign students chatter in every langauge and Abbey Churchyard performers call for audience participation. Tour buses tour, shoppers shop and Happy Hour revellers spill out onto the road. Pubs and clubs – and a casino now open for business, fill the night-time hours while homeless settle down for bed in doorways. Georgian buildings fall into disrepair, a new boutique hotel opens and beggars return to the streets. What New Year’s resolutions will be made this year?